The exact origin of Tang Soo Do, as well as of any of the martial arts in general, is obscure, though there are a number of historical theories. The most credible and traditional view is that martial arts originated not in any one country, but in almost all parts of the globe, as they were needed by primitive people. The ancestral art of Korean Tang Soo Do can be traced back approximately 2,000 years. At that time, Korea was divided into three kingdoms. 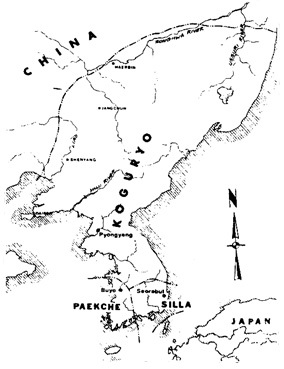 Koguryo was founded in 37 BC in northern Korea. The Silla Dynasty was founded in 57 BC in the southeast peninsula, and Paekche, in the southwest, was founded in 18 BC. After a long series of wars, the Silla Dynasty united the three kingdoms in 668 AD. During this period of time, the primitive martial arts were very popular in warfare. This is evidenced by mural paintings, ruins and remains, which depicted Tang Soo Do in those days. Among the three kingdoms, the Silla Dynasty was most famous for its development of martial arts. A corps formed by young aristocrats who were called Hwa Rang Dan was the major group who developed those arts. These warriors were instrumental in unifying the peninsula as the new Silla Dynasty (668 AD-935 AD), and furnished many of the early leaders of that dynasty. Most Korean martial arts trace their spiritual and technical heritage to this group. The names of some groups and arts reflect this, such as Hwa Rang Do or Hwa Soo Do. Our Five Codes of Tang Soo Do, originated by Won Kwang, a monk, are part of their spiritual heritage. The unified Silla Kingdom was overthrown by a warlord, Wang Kun, in 918 AD, and a new kingdom, called 'Koryo,' lasted for 475 years. In 1392 AD the New Kingdom, the Chosun (Yi) Dynasty, succeeded and lasted about 500 years. Approximately a thousand year period elapsed between the two dynasties. Tang Soo Do became very popular among the military society. However, most importantly, this art also became very popular with the general public. In those days it was called Kwon Bop, Tae Kyun, Soo Bahk, Tang Soo, etc. The very first complete martial arts book was written at this time. This most important book is called "Mooyae Dobo Tongji." 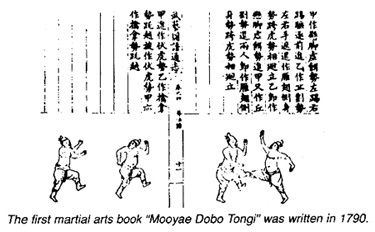 It was written in 1790 AD and contained illustrations that substantiate the theory that "Soo Bahk Ki," the formal name of Tang Soo Do, had quickly developed into a sophisticated art of combat techniques. These founders started to organize their own organizations respectively, and Master Hwang Kee organized the "Korean Soo Bahk Do Association" on November 9, 1945. Besides the Soo Bahk Do Association, there were various types of other martial arts called "Kong Soo" or "Tae Soo" existing in Korea. In 1965, all of these various systems were united into one organization, called the Korean Tae Kwon Do Association and the art was called "Tae Kwon Do" uniformly. As a Korean national sport, Tae Kwon Do initiated a new era. Instructors were dispatched throughout the world and international tournaments were held. In those days, Tang Soo Do and Tae Kwon Do were divided principally, with Tang Soo Do striving to remain as a traditional martial art while Tae Kwon Do held its world games and sports. In 1968 Master Jae Chul Shin came to the United States of America as the U.S. representative for the Korean Soo Bahk Do Association. He formed the United States Tang Soo Do Federation in Burlington, New Jersey. The organization expanded to all parts of America and foreign countries. This traditional and classical art was quickly accepted and soon grew in popularity throughout America and the world. After 14 years of Tang Soo Do promotion in the U.S.A. and the world, the organization was reorganized to fit new international and domestic demands. 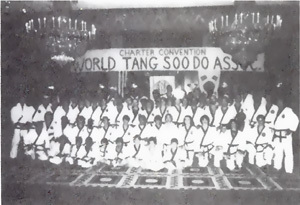 On November 13-14,1982, a Charter Convention for the World Tang Soo Do Association was held in Philadelphia, Pennsylvania. At the Charter Convention a new constitution was passed, a new logo and insignia were selected, the uniform and belt system were revised, and new organizational standards were adopted. Most importantly, Master Jae C. Shin was recognized as Grandmaster of the World Tang Soo Do Association. With proclamation of three mottos, Traditionalism, Professionalism and Brotherhood, the advent of the World Tang Soo Do Association evoked the interest of many international martial artists, whose genuine interest was in the Art, and was not sport oriented. This organization has grown at an outstanding rate to reach over 100,000 members in 36 countries. Thousands of students are training in the following countries; Argentina, Australia, Belgium, Brazil, Bolivia, Bulgaria, Canada, China, Chile, Columbia, Costa Rica, Czechoslovakia, England, Germany, Greece, Guam, Holland, India, Italy, Korea, Mozambique, Mexico, Pakistan, Peru, Philippines, Poland, Puerto Rico, Rumania, Russia, Scotland, Seychelles, South Africa, Saudi Arabia, Sweden, Uruguay, and the U.S.A. 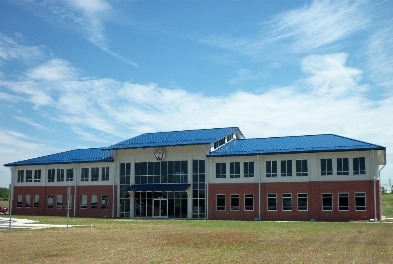 In July of 2012, the WTSDA entered a new chapter with the Grand Opening of its new World Headquarters in Burlington, NC. This was the fulfilliment of a dream for Grandmaster Shin, wo had strived to make this happen for over twenty years. Grandmaster Shin had the opportunity to see and work in this building prior to his passing on July 9th, 2012. According to his son, Robert, Grandmaster Shin's feelings were expressed with one simple word: "Wow." Having become one of the most respected traditional martial art organizations, the World Tang Soo Do Association is entering the new century striving for new dimensional development.